Before anyone gets excited: I’m cheating here. This is not a native NX client for Android (more on that at the end of this post). I’m running ubuntu in a chroot environment under Android. It works surprisingly well though. Installing Ubuntu in a chroot environment is not the scope of this post. Complete Linux Installer from the Google Play Store makes the process relatively pain-free. 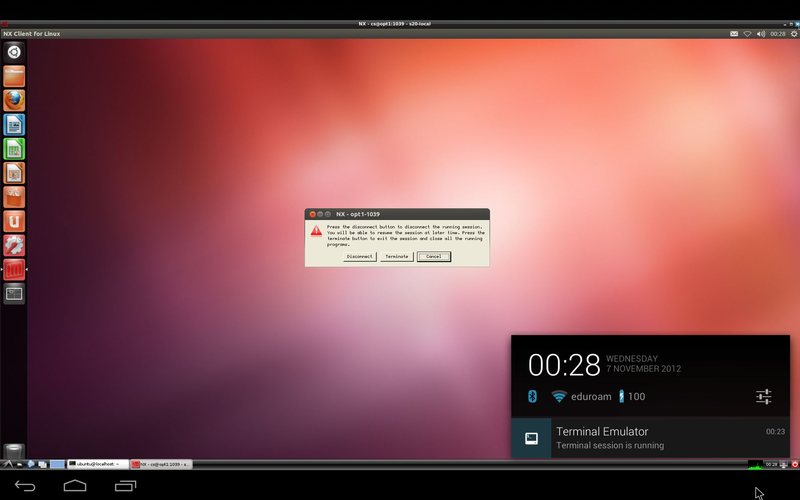 Go for Ubuntu 12.04 with the LX Desktop Environment that comes with the “Small Ubuntu Image”. That’s it. Open a VNC connection to localhost:5902, select “Run” from the start menu and launch opennx. It should be pretty straightforward to build a native NX client connecting to a native X server. I’ve already ported most of the dependencies for another project. Let me know if there’s any interest. Would love a native android nx ckient, thanks. Xrdp is ok, freenx rocks. Compiling opennx I get and internal gcc-4.6 error. Everything went well until that step? Could you post the exact error message? I originally used the large ubuntu image. using the small image as you reccomend works fine. Now how do I use it. Like how do I get the keys right. When I connect to a known good nxserver, I get the logo screen but then it times out, Any ideas on why. I’m not sure where it could be logged. Ok, I started over again on a HP touchpad tablet and all went well. It works perfectly. So yhe nook color just can’t do it. I found qtnx 0.9-3ubuntu4 to be working quite good and performant on ubuntu12.04 (lxde-Image from Complete Linux Installer on Android 4.04 stock, Samsung P3110). No rendering issues at all yes. FreebVNC however seems to be more stable than androidVND. I’m interested in a native NX client for Android. Perhaps bVNC, my open-source VNC app with AutoX functionality, would serve your purposes? AutoX provides the same functionality as NX but uses VNC rather than a compressed X protocol. The back-end consists of x11vnc and Xvfb or Xvnc. Hi there, you will see how development is coming along with both the Android and iOS native clients on our Facebook and Google pages. They’re part of the roadmap for NoMachine 4, currently in beta (2).